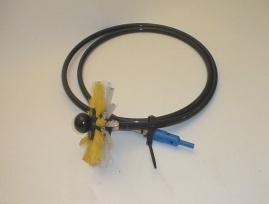 AirPower axles and brushes can be used also in small air ducts! 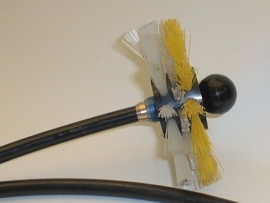 The stiff axle head with brush body has been constructed so that the brush is rotating on the flexible axle, thus preventing a break down of the axle in bends of a small duct. Same brush suitable for fine and rough dust and particles. The axle cover makes an unexceptionable, almost frictionless rotation possible. AirPower axles rotate in both directions! A shortening of an axle, when necessary, takes only about 5 minutes. Self concentrating brushes suitable for all brushing devices on market (with adapter).